Built in 1900, the home is most likely similar to when it was first built, though the area surrounding it has changed greatly. 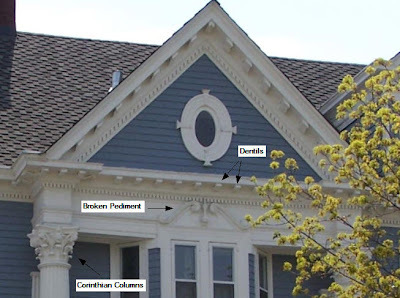 Designed as a Colonial Revival mansion, the home has distinguishing characteristics of the style including full height column Corinthian capitals, dentils at the cornice with decorative molding, and a broken pediment above the door. The front door is also typical with its fanlight above the door and side lights. The main home was recently restored to its former beauty and is currently listed for sale by Remax Results for $1,995,000. It boasts about 6500 square feet with 7 bedrooms and 7 bathrooms. The carriage house has also been restored and is currently zoned as a condo. Built in 1900 as well, it now has 3 bedrooms, 2 bathrooms, and is approximately 1800 square feet. It is listed separate from the house for sale for $649,900. If you would like to view the home, a real estate open house is available May 6, 1-3pm.